Too cold for salad! Kale salad transitions pretty perfectly to kale soup, though. This is my basic recipe for chopped vegetable soup as opposed to my one of my oldest recipes, creamed vegetable soup, and actually I like turkey meatballs in that too. 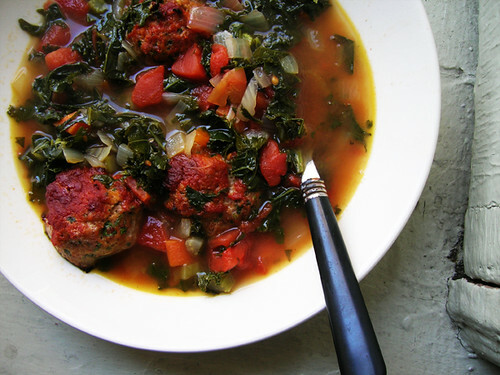 Now you could start with the turkey meatball recipe and just cook the meatballs in the soup, that works. I had already-baked turkey meatballs on hand and plated them with the soup, which was easy and good. I don't know how well meatballs hold up in soup for a week, but then again who cares if they fall apart. Though what if you want to just snack on a turkey meatball, that happens. Heat a little bit of olive oil in a large saucepan over low heat while you dice the onion, celery, and carrots, adding the vegetables to the pan as they are diced. When they're all in, stir them up and turn up the heat a bit. Then stem and chop the kale, and add it to the pan. Saute over high heat until the kale is wilted. Add the diced tomatoes and the chicken stock. Simmer soup over medium high heat for about twenty minutes. If you're cooking the turkey meatballs in the soup, you would add them at this point; if you have them already made, plate them three to a bowl and ladle the soup over them.